← Why food is so expensive in Kosovo? This model doesn’t seem to work, now what do we do? The beginning of a new year offers the opportunity to take stock of the past, reflect on the current and look forward. Here follows a mix of anecdotes and facts, a snapshot of the current situation in Kosovo, as I see them going through my daily routines. Let’s start with health, which is clearly one of the most important issues for us, as human beings. In case a family member or friend fall ill, we are more likely to jump in the car and drive to the hospital in Skopje than venture into a medical clinic in Pristina. When push comes to shove we don’t have faith in our health system. The national water supply is running dry due to lack of snow and rain in recent months. In my apartment the water is usually turned off between 11.00-15.00 and 22.00-06.00, totaling 12 hours without running water every day. Now, the water is off for 18 hours a day. The water supply and infrastructure appear not to be up to par, which makes you wonder what the hot summer has in store for us. I am no electrical engineer but my feeling is that the electricity supply to my apartment is more consistent and stable nowadays (no cable has melted in the last year), and I assume we have a certain Turkish investor to thank for that. I still can’t dry the laundry on the balcony because of street dust, coal fumes and air pollution from the lignite-fuelled thermal power plant in Obilić that instantly penetrate the cloths. In 2004, the Ministry of Environment proclaimed that the Kosovo A power plant omitted about 2.5 tons of dust per hour (74 times higher than European standards). NY Times recently reported that in Obilić alone, 30% of the people are suffering from chronic respiratory diseases (July 11, 2011). From an environmental point of view, things does not appear to have improved in Kosovo during the last 10 years. Leaving the comfort of my home, strolling towards Mother Theresa street, I reflect for a moment on the high occupancy levels in the city’s numerous cafes and restaurants. I see unemployment mixed with under-employment in those coffee cups. The real unemployment figures are difficult to pin down when the informal economy is as persistent as it is in Kosovo, but according to the Labour Force Survey (2012) the total unemployment rate is 35.1% (male 28.1%, female 40.0.%) Among youth (15-24 years) the unemployment rate stands at 55.3 %. The youth unemployment rate is additionally alarming when taking into account that 30% of the population of Kosovo is between 15-24 years old. 65% of the population is under 30, which makes Kosovo the country with the youngest population in Europe. This fact, we are to believe, is a competitive advantage, especially in relation to an aging Northern Europe. This conclusion is of course based on the assumption that there are enough employment opportunities in Kosovo to absorb this latent working force, which there isn’t. Not a pretty prospect for the future if you happen to be one of the 36.000 young and hopeful Kosovars entering (or rather wanting to enter) the labour market every year. Unless you head off to Northern Europe, that is. The challenge in Kosovo is that there is not much economic growth to talk about. Current economic growth hovers around 2.5% (2013), driven mainly by government investments (i.e. Kosovo-Albania highway), private spending and privatization. This is far below the economic growth target of 7-8% per annum set out in the Kosovo Economic Vision 2011-2014 Action Plan, a growth rate deemed necessary to make a significant dent in unemployment. Kosovo’s GDP per capita is around €1.795, which is the lowest among Central European Free Trade Agreement (CEFTA) countries and at about 60% of Albania. Kosovo’s imports account for around 60% of GDP, while its exports cover only around 6% of GDP. Kosovo’s trade deficit is the highest in CEFTA and continues to increase (€602 million in first quarter of 2013). Export penetration remains extremely low creating the largest trade deficit as a ratio of GDP in the region (185% of regional average). The financial crisis slowed down Foreign Direct Investment (FDI) (7.1% of GDP in Kosovo) all over Eastern Europe, making attracting investors even more difficult for Kosovo. Remittances from Germany, Switzerland, Italy, and the Nordic countries (mainly Sweden) account for over 15% of GDP, while aid and donor-funded activities account for another 7.5% of the GDP (USAID/Kosovo Strategic Plan 2010-2014, 2010) The financial influxes of remittances and aid are bound to decrease over time, as the Kosovo Diaspora gets more embedded in their new societies, and the donor community moves on to rectify other more pressing issues elsewhere in the World. In summary, this means that the financial foundation of the Kosovo state is unstable as a consequence of its high dependency on remittances and foreign aid, and revenues generated by Customs, which in turn is under threat by free trade agreements. With the public sector financially incapable of employing more people, the only viable hope to reduce unemployment lays with the private sector. In Kosovo, less than 0.1% of all registered companies are large in size, meaning they have more than 250 employees. This means that 99.9% of the 120.000 registered enterprises are micro-, small- or medium in size. (Business Registry, 2012) However, this does not mean that all 120.000 companies are active, generating sales, economic growth and employment. To the contrary, less than 20% of all registered companies in Kosovo are active and pay taxes, according to the Kosovo Tax Administration. From these data we can conclude that private sector activity is very low, there is a high mortality rate among companies (16.7% more businesses closed in 2013 than in the year before), the informal sector is significant, and the government cannot rely on revenue collected from the private sector to even partially finance its public policy commitments. The total revenue collected by the Tax Administration in 2012 amounted to €396.9 million. Although an increase by 9% on the previous year it is ‘still insufficient to represent a sustainable source of revenue’. (EU progress report 2013) Unfortunately, the private sector in Kosovo today can best be described as a ‘survival mechanism’ whereby individuals generate some kind of ad hoc income to pay the bills and feed the family. It is hardly the engine of economic growth and savior of the nation’s finances that we would all like it to be. Until now I have presented a personal collection of anecdotes and facts that nonetheless point towards systemic shortcomings in the Kosovo situation, that when webbed together reveals a model that is simply not delivering on the fundamental requirements of the population. However, Kosovo is far from alone in discovering the limitations of the prevailing socio-economic-political model, and in experiencing a recent upsurge in poverty and inequality. I feel a bit uneasy quoting Vladimir Lenin (I am generally not a fan of communism’s societal solutions), but there is something acutely contemporary in the title of his revolutionary pamphlet ‘What is to be Done?’ published in 1902. In the case of Kosovo 2014, I believe, as an initial step to change its current course of chronically under-performing development, it’s time to first face reality, talk truthfully about the situation we are in, stop the spinning of development results and accept that the current model is simply not delivering. (If it is delivering, why do so many (young) citizens queue outside Western embassies for visas and/or are actively seeking to leave the country?) For years now the predominant model has pursued a ‘systematic route’ to change, meaning it has produced more and more of the same (more imports, more strategies, more projects), while ignoring the big picture, and the fact that there are no real improvements in the wellbeing of Kosovo citizens. To achieve improvements in health, pollution, employment, poverty, economic opportunities and other areas of society we must pursue a ‘systemic route’, opening up the possibility for ‘a change that changes the whole situation’ (second-order change). But the $100.000 question remains, who will instigate and implement this change process? Before attempting to answer this question, let’s explore who are the candidates, the potential generators of change in Kosovo today? In my opinion, the socio-economic-political model currently in place in Kosovo (and in many other countries for that matter) consists of a strong and mutually reinforced triangular relationship of power. Three vertices (group of actors) dominate, determine and drive the system of development in Kosovo. 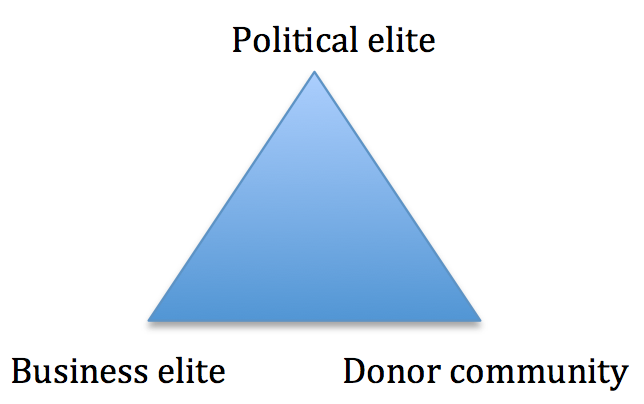 It’s a triangular symbiosis represented by the Kosovo’s political elite (vertex 1), a business elite (vertex 2) and the international donor community (vertex 3). Two other actors that are usually quite influential in shaping the public policy debate in more mature democracies – the media and civil society – play a very subdued role in Kosovo. Both the media and civil society often appear to be sub-ordinate to or entangled with the powerful three, for whatever reasons, which hinders the media and civil society from playing the constructive and critical roles that are expected of them in a well-functioning democracy. However, it’s within this new potential pentagon (five vertices) of public debate, checks and balances, mutual trust and shared responsibility that we also find the potential generators of change in Kosovo. Or rather, change may be generated as a result of their capacity to cooperate constructively among each other. Long-term and sustainable change cannot be achieved by one of the pentagon’s vertices alone, no matter how hard it tries. Let’s return for a moment to the current situation. Kosovo’s political elite includes leading representatives of all functions of government and public administration. Political parties rotate in and out of power through democratic elections, in line with universally held principles of democracy. This is a good thing. However, to hold ‘power over others’ appears to be the main political driving force in modern Kosovo, rather than policy. It is therefore rather difficult to appreciate whether a certain political party is adhering to a left leaning vision of socio-economic development, or it favors the solutions held dear by the political right elsewhere in the world. Rather, the core dividing line in Kosovo politics (as in many other transitional countries) appears to be power itself, either you have it or you don’t. When in power you are inclined to act a certain way to hold on to power as long as possible, while when in opposition you act very differently with the sole aim of assuming power as soon as possible. Policy appears to play no major role in shaping politics. Short-term thinking and actions prevail in a situation where more long-term strategic thinking and inclusive collective actions are desperately needed. On the second vertex we find Kosovo’s ‘nouveau riche’ business elite. This group of individuals and corporations has acquired their wealth rather quickly by pursuing one or both of two core business models. One, by staying close and supportive to the political elite they are winning public tenders and delivering products/services to the state. Within this business model the source of income is the national budget through government spending. In 2013, general government expenditure was €1.6 billion, while its revenue was €1.4 billion. (economywatch.com) Public spending, in particular on infrastructure projects (road construction), has been the main driver of domestic growth in recent years in Kosovo. Business model number two involves importing everything from petrol to tomatoes, and selling the goods on the Kosovo market. Here, the source of income is citizens’ private consumption. In 2012, Kosovo imported products for approximately €2.5 billion, while exports amounted to a trivial €181.5 million. (Kosovo Agency of Statistics) Limited exports mean that very little fresh money is entering the Kosovo economy. The only silver lining to this ‘trade-deficit-boosting-model’ is the income generated by the Customs (tax on imports) for the national budget. In 2012, this amounted to €844 million, making Customs the largest contributor to the Kosovo budget. (EU Kosovo report 2013) However, the current wave of free trade agreements will dramatically decrease this source of revenue, putting additional pressure on the national budget, and will certainly constrain further public spending. Now tell me who thought free trade was a good idea for a country like Kosovo that manufacturers very little, let alone exports hardly anything? Enter the large and sometimes overwhelmingly influential third vertex, the international donor community. After more than 15 years of international presence, it is safe to say that there is no area, no issue, no matter how small, in the social, political and economic life of Kosovo that has not felt the guiding hand of the numerous donor agencies active in Kosovo. Under the flag of reconstruction, institution-building and capacity-building, other countries’ tax payers’ money have been and are spent on building a new sovereign state capable of managing its own affairs. It’s estimated that between 1999 and 2010, Kosovo received €4 billion in aid, about 15% of GDP (Euronews, 17.02.2010) At the international donors conference of 2008, €1.2 billion were raised in support of Kosovo. But, even too much free money can turn into a bear’s hug, causing unintended, and sometimes negative consequences, which will take years to fix. One example is the distortion of the local labour market. The average salary of a civil servant in Kosovo is €386 per month and the total overall average salary is €355 per month. On average the salaries are lower in the private sector (Kosovo Agency of Statistics). A long-term staff on a donor funded project will make no less than €1.000 per month, with associated external consultants bringing in more than €100 per day! So, with two non-productive sectors of the economy – public administration and donor-funded projects – paying more, who wants to take the risk and work in the private sector, let alone start a company? From a human capital point of view, the distortion of salaries in favor of the public sector and donor world is pulling capable individuals away from the productive private sector. Potentially successful entrepreneurs and employers are now project managers or civil servants, rather than the next generation’s generators of wealth, economic growth and employment in Kosovo. In discussing the international donor agencies’ influence on the Kosovo state and society, one often hear the comment, “whoever pays, chooses the music”, which when taken to its logic conclusion in the context of development means something along the line of “It’s our money, so we decide on what to spend it and how”. So much for the noble proclamations about increased local ownership. Also, this approach puts the local institutions in a precarious situation, in which saying ‘No’ is not an option. They simply cannot afford to. In this ‘project-driven’ world, the donors present themselves to be ‘strengthening’ Kosovo – one project at the time, but again the real improvements in society are simply not there to be seen. The choice is not between accepting foreign aid or not, but to make the most of the available financial and technical resources by tailoring foreign aid to ensure long-term improvements in Kosovo society rather than the achievement of short-term activities and indicators. The same way that the local political and business elites need to take stock, reflect on the current situation, what has been done until now, what worked and what didn’t as well as what they can do differently in the future to produce improvements in society, the international donor community needs to reflect on the fact that it has been at it for 15 years now in Kosovo, and if the data on health, pollution, unemployment, poverty and on weak economic performance are anything to go by, well then at least we have to consider the notion that the current development frameworks and methods are perhaps not delivering the results we had hoped for. At this point in the article, I am surely being accused of being a typical consultant, as the joke goes, ‘coming out of nowhere, uninvited and telling people something they all already know’. Well, ok, let’s return to the $100.000 question on who will initiate and implement the required change, and allow me a moment more of your time to present my case. The economic problem in Kosovo is real, but I would not argue that it is a result of the country being without ‘natural resources, industries and strong agriculture’, (that’s too fatalistic) rather the failing economy is a result of our lack of internal capabilities and/or will to make full use of available resources (natural and human), develop economies of scale industries and explore our agricultural potential to the fullest. Kosovo is not predestined for poverty, but it’s only by our own individual actions that we can change course for the better. For me to produce a program for systemic change in Kosovo would be presumptuous to say the least. And to keep on preaching solutions from the outside would contradict my core argument about the importance of local ownership and sense of responsibility. However, as a guiding light moving forward, keep in mind that what we ‘value’ determine how we act in life. If we ‘value’ a clean environment, we will throw the Snickers wrap in the garbage bin. If we ‘value’ a more equal society, our policy priorities will be poverty-reduction and employment creation. The message is as profound as it is simple, and it places all of us, as individuals, in the driving-seat of change and development. Our individual value-based choices determine what desirable actions are actually culturally feasible. I will now venture out, highlighting a few key issues, which, I believe, are essential to boost positive change in Kosovo. First, positive change in the socio-economic-political situation in Kosovo can only emerge as a result of collective actions that are conceptualised and implemented by Kosovo institutions (public, private and civil society) and the general public. The international donor community’s role should be to support, partly fund, but not to micro-manage the process, allowing for a broad, healthy policy debate to tease out accommodation among different interests in society and most importantly to allow for a trial and error process, full of real learning experiences among local institutions and society as a whole. In other words, it’s time for the donor agencies to reduce the pampering and spoon-feeding, allow the new state to take their own decisions and make their own successes and mistakes from which to learn and move forward. It’s all a natural part of the growing up process. Second, introduce and enforce E-Government throughout public administration. Make public records available to the public! Transparency is the number one ‘Diminisher’ of favouritism, elitism and corrupt practices. Transparency also contributes to building trust between institutions and citizens, and among citizens themselves. Transparency is an essential element in strengthening a society’s social capital. Third, reduce the size of public administration. Increase the salaries of the remaining staff and make them accountable to their job descriptions and organisational goals. The role of the civil servant is, as its name reveals, to serve the citizens, but also to promote civility and defend the interests of the state (and future generations). The key is to make being a civil servant a respectable profession. This will require that our expectations of the civil servants and public administration are more in line with Max Weber, who argued that a bureaucracy is the most efficient way of organising human activity, and its goal is to maximize efficiency and eliminate elitism. The Ottoman and communist approach to public administration were quite different, acting more like an extended arm of the rulers to supress the citizens while at the same time serving the personal interest of state officials and the rulers. Hiring civil servants based on ‘what’ they know, and not ‘who’ they know, seems a good place to start the change process. Fourth, the Kosovo private sector, the productive sector that is supposed to generate both employment and revenues to the state is in desperate need of a complete overhaul and a jump-start. The economy does not need more start-ups and entrepreneurial spirit. Recent statistics show that a very large majority of Start-ups fail and close down before their third year of operation, incapable of generating profits on a relative small, crowded and protective market. The public policy objectives of entrepreneurship programs, measured in an increase in economic growth and employment, remain not satisfied. Rather the focus should move to the market leaders, to the very few Kosovo companies that are internationally competitive, or those that have the willingness to invest their own resources in order to improve their international competitiveness. We need to think BIG first and now, not small, in order to facilitate for the Kosovo economy’s real and rapid integration in the world economy. We need to think manufacturing and provision of services for export markets and economies of scale to effectively reduce unemployment. For this we don’t need more entrepreneurship training, business plan competitions and self-employment. What we need is smarter corporate management, stronger organisations and more old-fashioned hard work. It’s not until we are internationally competitive that our producers will be capable of taking on the imports at home. Consequently, a policy push for import-substitution must be based firstly on a push for improving the performance and competitiveness of individual local companies, and not on restricting access of imports to the Kosovo market. And history tells us that no country has managed to reduce unemployment and accumulate wealth without a push for manufacturing, at some point in their economic development. Take a good look at China and Turkey today, Taiwan and Hong Kong before them, and about a hundred years ago the industrial might of Germany was cemented (and in Germany’s case manufacturing is still a core sector of the economy and creator of sustainable employment, unlike in the US where much of the production has been outsourced). Manufacturing and exports hold the key to boosting the economy of Kosovo. However, we must realise that to some extent we are starting from scratch. There are very few manufacturers today that have the output volumes required to enter international supply chains. We have to create a new generation of industrialists in Kosovo. The importers and retailers, companies that have accumulated a substantial wealth in recent years, and clearly possess the most important business skill – to sell, are the most obvious candidates for leading this drive for the re-industrialisation of Kosovo. These companies, unlike any others in Kosovo today, have the financial, human and management resources to pull it off, as long as the corporate owners have the will to do so. From a business point of view, there is much to be gained by moving from import/retail on the small Kosovo market to manufacturing for the global market, as recent data from the region clearly illustrates. Macedonia (FYROM) exported €472.7 million worth of apparel products in 2011 (approximately 2.5% of GDP and 40.000 employees in the sector). With its traditions in apparel manufacturing and the fact that it is a relatively easy business to enter, Kosovo should be able to replicate Macedonia’s growth model in the apparel sector. Bulgaria is the number one exporter of medicinal plants in Europe, and the fourth largest exporter in the world. Bulgarian exports approximately 15.000 tons per year, mainly from cultivated herbs and spices. In Kosovo, most herbs and berries are collected in the wild. Hence, moving into cultivation could dramatically increase export volumes. In 2010, Serbia was the world’s largest producers of raspberries (63.000 tonnes), with total export sales of $200m. With its similar climatic and soil conditions, cultivation of berries constitutes a real business opportunity in the rural and mountainous regions of Kosovo. In neighbouring Albania, the footwear sector exported for $298m in 2011, mainly to Italy. With the completion of the highway to Albania reducing transportation time, footwear production opportunities in Kosovo should be of interest to the Italian buyers. As shown, there are enterprises and sectors in the region that are internationally competitive and there is no reason why Kosovo companies should not be able to reach the same levels of competitiveness and market outreach assuming that adequate managerial skills, technical support and government (donor) incentives are available. In turn, a few well performing and export-oriented companies will increase demand for other products and services supplied by smaller companies in Kosovo. The exporting companies and their management will act as road-models for the next generation of companies and managers. And finally, these exporters will generate new revenue for the state through taxes, and will contribute to an increase in viable employment. Fifth, and final, the media and civil society must rise to the task, and challenge constructively the existing model, its triangular relationship of power and their proclaimed development results. By challenging the status quo in society, demanding more transparency and accountability in public affairs and promoting broader stakeholder involvement in public policy formation and implementation, only then will the media and civil society have done their job properly. In conclusion, and to my defence, I am well aware that there are countless other challenges affecting the people in Kosovo than those I have brought forward. I am equally aware that my five key issues are not the only ones out there that will automatically set Kosovo off in the right direction, leading to prosperity, equality and happiness. There are other systems that need addressing as well, such as the legal system (how will it cope without EULEX? ), the education system (quality assurance, business orientation and too much focus on higher education? ), the financial system (how to bring down the lending rates? ), etc., and then we have the issues of Kosovo’s international recognition and its bilateral relationship with Serbia. However, we must be optimistic, constructive and pro-active in order to induce change within ourselves. We must recognise that systemic change involves taking simple actions within complex situations and not allowing the situation’s complexity to overwhelm us, stopping us from taking any action at all. This entry was posted in Uncategorized and tagged Kosovo. Bookmark the permalink. 5 Responses to This model doesn’t seem to work, now what do we do? I just sent you an email reply. Good job! Eventhow it hurts to hear those terible true facts! Great article Jakob, congratulation on this deep analyse of the situation in Kosovo. However I just want to add two things: 1. we should not forget that we are taking about an European country, with maximum 2 hours fly from every corner of wealthy Europe, so I see the situation a bit more positive in general, and 2. there is no need to have a sea to consider the potential of tourism in any country, Kosovo included. So in contrary to the Belgium expert’s strange statement above, I think natural and cultural resources of Kosovo are a good potential to start building and benefiting by the tourism sector in this country.